You guys, it was so nice outside this weekend. Maaaaaaaaaaaan. It was so nice I didn't wear my heavy duty parka, not once. It was so nice we saw the sun for BOTH days. It was so nice I finally sucked it up, tugged on my running shoes and ran outside for the first time since November/December. This weekend's weather practically offered you a drive to the airport, even though your flight was leaving super early and it hasn't been able to sleep in for months. At the risk of jinxing it, I won't say that spring weather is HERE, but this weekend certainly offered a great respite from the cold and the winter blues. The worst thing about it was daylight savings time, losing of a precious hour of slumber. Sure it's easy when you're sleeping in on Sunday, but tomorrow morning when I'm getting up at the new 6:15AM to go to work, I'll probably sit on the bus crying tears of despair into my extra large coffee. 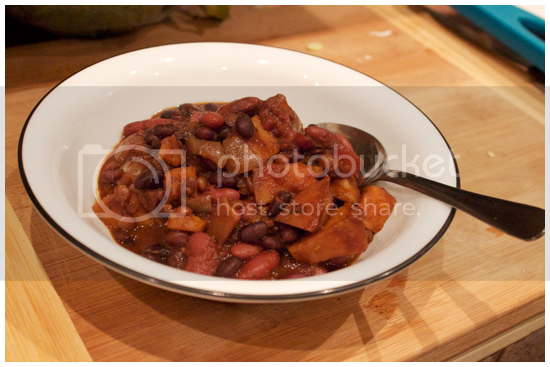 Whether it was the anticipation of a very welcome change of season, or the fact that I knew this week was going to have me hitting snooze too many times to pack lunch in the AM, I decided today would be a great to make one (possibly) last winter dish, my favourite vegetarian chili recipe. It's warm, delicious and it makes enough for a few days worth of lunches! Unless it's something very special, I usually cook from scratch without a recipe, a skill I attribute to watching many years of kitchen improv by my mama. 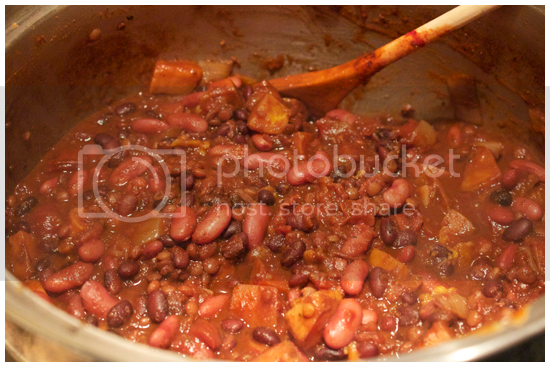 However, one day, when I was throwing together a random chili, I peered down into the simmering pot and had a thought. I was reminded of the first time I ate Mole sauce, in Texas while I was shooting a documentary for my final film project at Sheridan few years ago. Mole, a savoury sauce, is mostly defined by the fact that it contains Mexican chocolate. On a whim, I threw a spoonful of cocoa powder with the rest of the spices, and I haven't strayed from this recipe ever since. Nor have I written it down...until now. 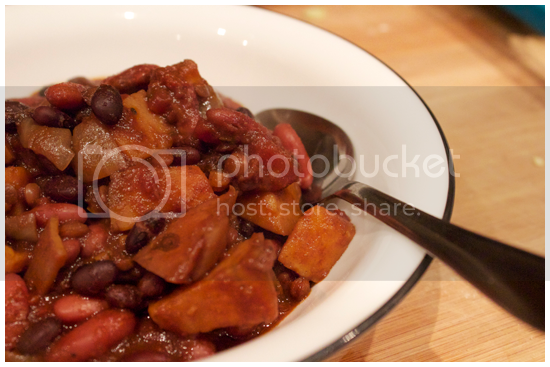 This recipe is pretty free form, you can add what beans you like, and the sweet potato adds an extra layer to the satisfaction level in an otherwise meat free dish, so any carnivores in the house won't complain (too much). I know it sounds loony, but the addition of the cocoa and even a touch of cinnamon add a savoury depth to the body of this chili that you don't get just any ol' place. It's not so much that when people eat it, they immediately spot the oddity, it's that they take a bite, and then they go, "what IS that?" You can smile brightly and answer, "it's delicious." Your beans of choice (I added half a cup of dried lentils to mine, for heartiness. )*See notes. 1. 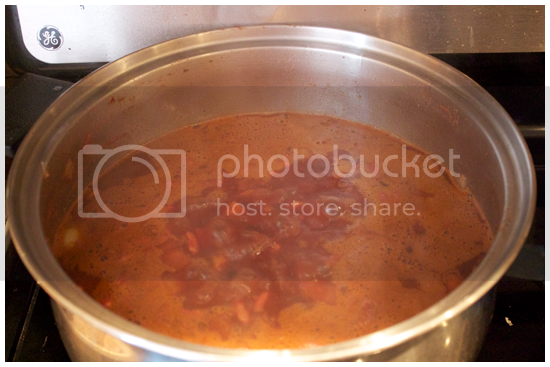 Put a large pot over medium-low heat. Saute the onion for about a minute. 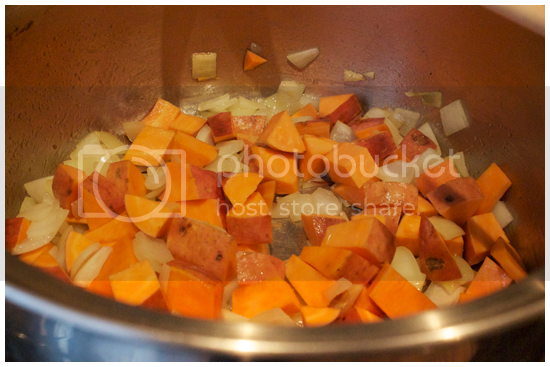 Add the sweet potato and continue to cook for about 5-7 minutes. 2. 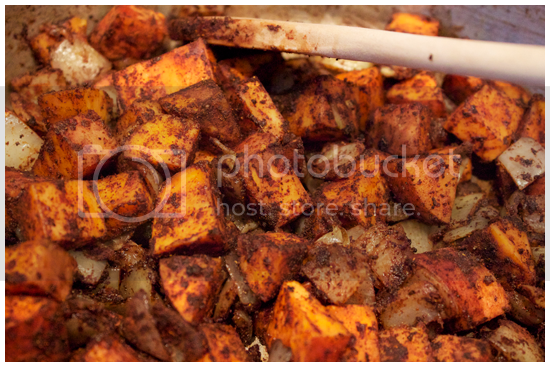 Stir in all of the spices to that everything in the pan is evenly coated and fragrant. 3. 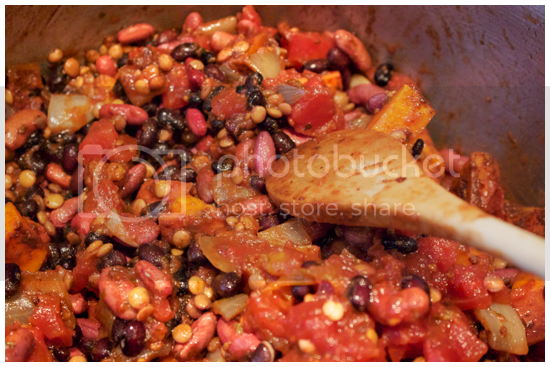 Add in the beans, the tomato paste and the canned tomatoes, stir again. 4. Pour in the four cups of veggie stock and bring the mixture to a simmer. 5. With the lid off, simmer on low-medium heat for an hour (at least) to thicken, stirring occasionally. The longer you let it simmer, the better the flavour and texture of this dish will be. 6. When the chili has reached your desire consistency, turn off the heat. Taste, then add salt and pepper as needed. Serve in a bowl with any of the fixings you please! Some options might include garlic toast, tortilla chips, cheddar cheese, sour cream, hot sauce (my personal favourite), avocado or hell, all of them. *I used dried beans for this recipe (1 cup dried black, 1 cup dried pinto, 1/2 cup green lentils) soaked in water overnight for 12 hours. Dried beans take a longer time to cook up, so if you're in a hurry, I would use canned. On the other hand, with time on your side, dried beans are less expensive than the canned variety and they have a nice bite. I know this because Tyler knows this.